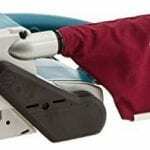 Sanding is not the most glamorous job around, but it needs to be done and if you are going to buy a sanding tool you need to select the best belt sander you can get. We take a look at ten of the best on the market that are available at Amazon now and give you in insight into their size and weight, how much power and variable speeds they offer. We look at how easy it is to change out the belt, if they offer dust collectors and how comfortable they are to use. View the Best Belt Sander for the Money, Below. Are Sanders Difficult to Master? How to use a Belt Sander on a Deck? 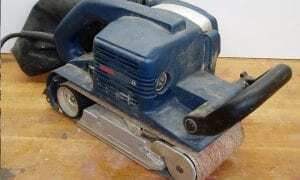 Can you use a Belt Sander for Hardwood Floors? How to Change Sandpaper on a Belt Sander? We look at how they operate, how ergonomically designed their handles are and for what kind of jobs they are most suitable and best at. Our reviews are comprehensive and in addition to the basics you can expect from each sanding tool we review, will cover the most frequently asked questions when looking to purchase a belt tool in our buyers guide. If you are looking for power and speed coupled with ease-of-use then you found it in the Makita 9903 Variable Speed Belt Sander. The Makita sander is perfect for working with wood, and is the ideal tool for furniture makers or carpenters, floor installers or deck builders as well as general contractors. The Makita has a powerful 8.8 AMP motor and can maintain a consistent speed even under load with the electric speed control. It is highly efficient and will remove material fast and accurately. The Auto-tracking belt system will track the belt without needing adjustment. Thanks to the innovative design of the Makita it will allow you to sand flush to the wall with the nose and side of the sander. The Makita only puts out 85dB which is a lot less noisy than some of its competitors and one of the quietest in its class. The ergonomic, large front grip will allow you to operate the Makita sander is comfortably and its low profile design will provide better balance. The Makita also offers efficient dust collection with the cloth dust bag, which will reduce dust in your work area significantly. The 16.4 foot long power cord allows you to maneuver the Makita easily. See more information on Makita 9903 Variable Speed. Powerful, fast and with quiet operation this is the perfect tool for you to do your cabinetry work or any other woodwork. The Makita 9903 Variable Speed Belt Sander is one of the best belt sander on the market with great features and easy operation it is ideal for home or commercial use. The Porter-Cable 362 Belt Sander is the perfect tool for both professionals and hobbyists alike. This 4” x 24” sander offers you variable speed control with a powerful 12 AMP motor which sits directly over the plate affording the Porter-Cable perfect balance. The heavy-duty all metal design of the Porter-Cable makes it very durable and perfect for the commercial environment. A Variable Speed Dial allows you to select your speed settings from 1000sfpm to 1500sfpm. It offers a belt-tracking knob so you can adjust it quickly and easily. If you need to change out your belt while working on a job the Porter-Cable has you covered with quick-release change lever as well as a fingertip belt-tracking knob, which will reduce excessive down time while working and allows you to dial in belt alignment over the rollers. The large capacity dust collecting bag can swivel 360 degrees, this is highly efficient at collecting the dust as the sander does its work. The fact that it can swivel ensures it will not get in your way as you work either. Adding to your comfort is the ergonomically designed handles. See more information on PORTER-CABLE 362. Whether you are looking for a belt sander that will work well in a commercial environment but will be just as at home in your garage the Porter-Cable 362 Belt Sander fits the bill. It offers a multitude of great features as well as a powerful motor. The Genesis GBS321A Belt Sander is versatile, fast and very efficient and perfect for anybody working with wood including floor installers and carpenters. It is reliable and will give you the best results time and again, general contractors will love this product. Featuring a powerful 8.0AMP motor it will operate with constant speed even under load with the electronic speed control function. The variable speed control dial allows you to match the speed to the application. The Genesis offers a low profile design which will provide the user with great balance and with the flat-side it will allow you to get into those tight spots and it offers flush sanding. The auto-tracking system will track the belt without adjustment. Featuring a single lever quick-change, this feature will insure that you have minimal downtime, and the dust collection bag is very efficient and will greatly reduce the amount of dust in your work area. Working on larger projects is no problem with the Genesis, it offers a 6.5 foot power cord so you can reach where you need too. The genesis is a lot less noisy that some of its competitors and the front grip handle is adjustable offering both comfort and ease of operation. See more information on Genesis GBS321A. A great belt sander that are feature packed and offers a powerful motor to get the job done quickly and accurately. Easy to operate, comfortable to handle, and with a low noise factor the Genesis GBS321A Belt Sander is perfect for both the hobbyist and the general contractor alike. The Makita 9403 Belt Sander is a 4” x 24” sander that offers not only great power and speed but is one of the quietest on the market today putting out an incredibly low 84dB. The Makita 9403 Belt Sander with Cloth Dust Bag is efficient in stock removal and is the ideal tool for carpenters, deck builder as well as general contractors who require a fast, reliable sander. Featuring an 11 AMP motor that has electronic speed control which will maintain a constant speed even under load. The extended base will allow you to sand flush against the wall and the 4” wide belt coupled with 1640ft./min speed ensures fast and efficient stock removal. The grip of the Makita is ergonomically designed and is large enough to allow for the utmost comfort while operating. Easy lever control allows for changing your belt to be quickly and easy preventing any delay in continuing with your work. It features a replaceable ceramic wear plate and a low profile which offers great balance and keeps gouging to a minimum. Double insulation and labyrinth construction seals the motor and bearings keeping them free from contamination making this a very durable belt sander perfect for commercial use. The 360 degree swivel cloth dust bag will ensure efficient collection of dust and keep your work area as dust free as possible. See more information on Makita 9403 with Cloth Dust Bag. The perfect tool for general contractors and home users alike. Great features and a powerful 44 AMP motor with speed control, comfortable handle and a mere 84dB noise output makes the Makita 9403 Belt Sander with Cloth Dust Bag one of the best available on the market in 2017. The Wen 6502 Belt Sander with Cast Iron Base is a brilliant two-in-one sanding machine that offers not only a 4”x36” belt but also a 6”x”6 disc belt and will tilt from zero to 90 degrees. This is a perfect sander for heavy duty jobs and the cast iron base will prevent heavy vibrations. The 4.3 AMP motor offers 3600 RMP which is more than enough power to sand, smooth and remove all splinters or jagged edges from your wood as well as offering enough power even under heavy load to avoid bogging down. A tension release lever allows for a quick and simple change to sandpaper grit. The dust port is 2.5“, attach your dust collector to the port and keep your workspace as clear of dust and debris as possible. The Wen belt sander’s cast iron base will prevent wobbling and walking, so your sander will remain where you need it without deviation while sanding. The adjustable belt can tilt from vertical to horizontal and every position in-between to allow you to work on any project you want to. Add to this the sanding disc has a supporting table with 0-45 degree beveling capabilities as well as a removable miter gauge, and for safety it has an extended safety guard. See more information on WEN 6502 with Cast Iron Base. If you need a belt sander that is both powerful and versatile and can handle heavy-duty projects then you need the WEN 6502 Belt Sander with Cast Iron Base. A two-in-one belt sanders offering both belt and disc sanders as well as many other great features. Easy, safe and comfortable to operate. Looking for a great belt sander that will allow you to reach even the most inaccessible corners as well as being lightweight and compact and offering ease of operation? The Black & Decker DS321 Dragster Belt Sander offers the home user all of this and a lot more. The front roller of the Black & Decker will allow you to get into even the tightest corners and will reduce the need to flush sand. It offers a 6.0 Amp motor that is powerful enough to tackle most projects. For superb control the Dragster offers a retractable, three-position handle. The Dragster DS321 allows you to change your paper out quickly and easily with a belt release lever and adjustment knob, which also ensures that the belt will remain in the correct position. The dust collector is very efficient and will keep your workspace as dust free and clean as possible as well as improving visibility when working. The Black & Decker Dragster includes a medium grit sanding belt and weighs a mere 8.2 pounds. Offering a 2-year warranty the Black & Decker is a great tool for all home improvement enthusiasts. See more information on Black & Decker DS321 Dragster. Home improvement enthusiasts will love these great belt sanders with their innovative front roller design to allow them to access even the smallest of corners. With enough power to get the job done quickly and efficiently the Black & Decker DS321 Dragster Belt Sander is definitely a best buy. Very reliable two-in-one belt sander that will both sand and polish efficiently and offers some great features as well as a powerful motor for the serious home craftsman and a must have tool on your workbench. The POWERTEC BD1500 Belt Disc Sander offers a belt size of 1”x30” and a disc size of 5 inches. The ideal tool for home improvement enthusiasts and anybody that need reliable sanders for their projects. The POWERTEC has a powerful 2.5 AMP induction motor which will offer a non-load speed of 3450 RPM and delivering 1/3HP, more than enough power to tackle most projects. The tilting tables of 4” x 7¼” size tilt at 0-45 degrees and include a mitre gauge, these features ensure that you get precise angle sanding every time. The POWERTEC BD Belt Disc Sander’s tracking adjustment feature will ensure that the belt runs true and the two 1.5” dust ports will keep your work area clear and clean. The back plate and roller guard of the POWERTEC BD1500 Belt Disc Sander can be detached to allow for quick and easy belt replacement. The POWERTEC is well worth the price you pay for it. See more information on POWERTEC BD1500. An all-in-one belt and disc sanders that offer great value for money and excellent power with a host of features to let you tackle any sanding or polishing project. The POWERTEC BD15000 Belt Disc Sanders are one of the best all-in-one belt disc sanders on the market in 2017. Have a project that requires a belt sander that is perfect for using on wood or steel and are also great for removing paint, the Hitachi SB8V Variable Speed Belt Sander fits the bill perfectly. A great belt sander with a host of features that will allow you to tackle any project with speed, accuracy and comfortably. Hitachi’s Powerful 9 AMP motor has offers a no-load speed of 820 – 1475 ft/min with a trigger lock so you don’t have to hold the trigger down constantly. The variable speed dial will adjust the speed making it a lot more manageable during operation. Need accuracy, the Hitachi offers a clear front cover tracking window allows you to see the sanding surface and the sanding belt and make sure you remain on track. Need to get into tight corners, the Hitachi has placed the dust collection bag on the left hand side and this will help you to get into those tight corners as well as being very good at reducing the dust, keeping your work area clean and clear. It is extremely durable with a wear-resistant V-belt that will extend the life of your Hitachi SB8V2 up to twice as long as normal sanders. Soft elastomer grip on the main and secondary handles make this one of the most comfortable sanders to operate. See more information on Hitachi SB8V2 Variable Speed. Fast, accurate and extremely durable with a soft comfortable grip on all handles makes the Hitachi SB8V2 Variable Speed Belt Sander is one of the top belt sanders on the market in 2017. The Hitachi SB8V2 Variable Speed Belt Sander is versatile and powerful and the ideal tool for the home improvement enthusiast. Another great offering from WEN the WEN 6321 Belt Sander with Dust Bag the perfect tool for smoothing out those rough edges and getting your surfaces splinter free and as smooth as can be. The 7 AMP motor will rotate the belt at a rate of 820 ft/min will get though any project quickly and efficiently. It is compact in design and lightweight weighing in at 6 pounds which is great for limiting fatigue while sanding. Another aspect that helps to limit fatigue while working with the WEN 6321 is that it offers a lock-in safety features so you do not need to keep a grip on the trigger all the time. The Tracking Adjustment knob keeps the belt true and a quick release sanding belt allows for swapping out sandpapers or adjusting grits easy and the front roller is designed with an extended front past the edge of the housing to allow you to reach into tight corners. The dust bag is large enough to ensure that your workspace remains as clean and dust free as possible while working. The WEN 6321 Belt Sander with Dust Bag comes with an 80-Grit Sanding Belt with additional belts available in three packs. See more information on WEN 6321 with Dust Bag. Perfect for those woodwork projects you want to tackle with great features, lightweight and compact with lock-in safety feature, quick release sanding belt and lots of power, the WEN 6321 Belt Sander with Dust Bag is everything you will need in a belt sander and a must have tool in your garage. A compact belt sander that will allow you to get all those DIY projects done in no time at all. The Porter-Cable 371 14” Compact Belt Sander is designed for both the DIY home improvement enthusiast as well as the professional in mind. It is packed with features and designed for comfort.Sand at any angle with the Porter-Cable 371 as it is only 2½” x 14” and weights a minuscule 5 pounds making this one of the most compact belt sanders on the market in 2019. The textured rubber body grip allows for one-handed control and the removable auxiliary handle allows you to use two hands when needed. The Porter-Cable has a fantastic balanced feel so you can use it vertically or horizontally or any other orientation you need to use it for your project. The design of the Porter-Cable 371 is such that it has a flush side to enable you to brush right up to perpendicular surfaces and it will cover a wide surface area. The power switch is recessed and dust-sealed to you won’t turn it off accidentally while using it and the removable dust port will keep your work area clean and dust free. See more information on PORTER-CABLE 371 14″. Great belt sanders for DIY enthusiasts and professionals alike. Great balance and light weight allow for one handed use and an auxiliary handle offers two handed grip if needed. The Porter-Cable 371 14" Compact Belt Sander is one of the best compact sanders on the market in 2017. If you have ever tackled a DIY job of sanding down your tabletop or stripping paint off of something in order to repaint it then you know that these are very tiresome tasks that take a long time if you do it by hand, to the best of your ability. DIY enthusiasts and professional craftsmen, general contractors, and deck builders use sanders to get through the physically tedious job of sanding down surfaces, smoothing rough edges and stripping off paint in the best way. A belt sander is a powerful tool that is true workhorses in your arsenal of tools and makes your life so much easier when tackling large sanding jobs (click here to read the study). There are many different brands of sanders as well as different types of sanders including the all-in-one belt disc sanders. A sander consists of an electric motor, this motor turns a pair of drums and over these drums, a continuous loop of sandpaper is mounted. Sanders comes with various size motors and various features such as variable speed control, automatic belt tracking and more (view the study from ALCE on the different parts of the tool). These sanders vary in size from the small handheld versions (click to read the study of uses) which we have reviewed for you to the very large that are used in manufacturing plants. Most of them are used for sanding wood but can be employed for sanding other materials including metal, and of course other purposes such as stripping paint. These power tools are very different to your standard power tools such as a drill-disc and yes they do take a little getting used to. They are a lot larger and heavier than these tools and they are also very lively when in operation and controlling your sander is paramount to getting the best result you are looking for. In saying that, once have used one of these best rated power tools once, you will wonder how you ever coped without them. If you have never used one before it is very important that you spend some time getting to know the product, read your manual and understand all of its functions such as how to change the belts, how to use the adjustable belt tracking and how to apply it to your material best. Although most sanders are very similar in operation, their features do differ from product to product. Once you know how to work your sanders best, you will need to practice on a few types of material that you are usually working with before tackling your actual project. You need to gain some experience, or you may find that you can ruin your sanding project and have to start again. Getting used to how it will gnaw at the material you are working with as you sand, is one of the aspects you need to master when starting to use your tool. Try it out on softwoods, hardwoods, and even plastics or laminated sheets and get used to the feel of the machine as you work with it. Usually, these tools are used to remove unwanted material from your surfaces, such as smoothing out edges and removing splinters from surfaces rapidly by sanding them out. They have an aggressive action and are mostly used only in the beginning stages of a project. A sander can also be used to remove paint or various finishing from wood. These tools are used to shape and finish off your wood and other materials as well, depending on the type of sandpaper you are using. If you have your sander fitted with fine grit sandpaper, you will get a great, super smooth surface after sanding. Your all-in-one sander can also be used to polish your surfaces once you have a finished product. A lot of people see the size of a deck and think a big floor sander is needed for sanding such a large surface (view the study here). Not so, in fact, these are not the best tools for the job of sanding your deck. They will not be able to get to every part of the planks as well as not handling surfaces that are not completely flat very well and deck boards tend to be a little curved so when sanding with floor sanders will not end up sanding evenly. Your best bet when doing this job is a sander tool. Combining your sander with a palm sander and sanding sponges for the more inaccessible areas of your deck is ideal. Be sure to have the best safety gear such as goggles and dust masks before you start your project as the dust made with sanding such a large area can be quite stifling and not to mention bad for your health. You will start with a heavy grit belt, in the range of a 50 grit, and then work backward on the boards. Cover all the boards on your deck and use the palm sanding tool for areas you cannot reach and then the sanding sponge for the areas your palm sanding tool cannot reach. Once this is done, you will start from the beginning again, this time using a lighter grit for your sanding such as a 60/80. Once this is done you will see that your deck has a lovely smooth surface best to be able to take the stain you will apply consistently. The short answer is yes you can. However, you must be aware that it is going to be a lot of hard work and it is not the best tool for the job; that distinction will fall to the floor sanding tool (click here for random orbital sanders). However a lot of people choose to sand their floors by hand, and the best out of all the handheld sanding tool for this job is the sanding tool. These may not be as fast as your floor sanding machines but it will get the job done with a reasonable amount of speed. Try and keep with the grain of the wood and keep your machines moving in circular motions or backward and forward and side to side. The more pressure you apply to your sanding tool the quicker you will be able to get the wood back to bare through your sanding efforts. There are five basic steps to change the sandpaper on your sander no matter what brand you are using. You need to release the belt tension lever as all belts on these tools are tensioned to be held in place. You do this but pulling it back and you will see that it will become slack. Align your new one with your sander. Make sure that it is placed in the right direction, there should be arrows on your belt and on your sander, make sure these arrows match up. If you put it on in the wrong direction it will break. Slide the belt onto the sanding tool and then align it to the wheels making sure it fits best. You will need to re-tension your belt. You can do this by using engaging the tension lever on your sander. Every type of sander will be different in design and features, however, most have the same basic operation. It is always best for you to read your particular product’s manual thoroughly to understand its particular functionality. It is best when using your tool, no matter which one you have purchased, you must remember that your sander must always be switched on before you place it on your material and not switched on after you have placed it on the material. You must make sure that the flat paten is always parallel to it when you lower it down onto your material. Once you have your sanding tool in contact with your material it is best to keep it moving to avoid dishing out. Remember your sanding tool is heavy so the pressure it exerts on your material is more than enough, if you add more pressure by bearing down on it you could ruin your material, all you need to do is guide your tool in the direction you want it to go. Another best tip is to move with the grain of the wood when using it to sand any kind of wooden material. If you go cross grain, you run the risk of creating a deep groove and especially if you leave your sanding tool in one position for too long. Then there is the best practice safety aspects to using these power tools and we cover a few of them here for you to keep in mind when operating these power tools. Best practice in safety is always advisable when using any of your power tools (read the study on safety). First and foremost you will need to protect your ears as these power tools can be very loud and can damage your ears if you do not take proper precautions. Make sure that when you want to change the belt or empty the dust bag you switch the machine off, if you do not do this to try to save time, you could end up at the emergency room. Remember if you are going to be sanding metal, you are going to create sparks. This mixed with sawdust which is in the dust bag you could start a fire. Ensure that the dust bag on your machine is empty, it is best to either blow all the dust out, or vacuum it out to ensure there is no residual sawdust before you attempt sanding any metal materials. Hold your machine securely always, these are powerful tools and if you relax too much you could find it sliding away from your or worse into you. Finally, make sure that the machine is switched off before you plug it in. This may seem like a simple thing, however, it is remarkable how many times these tools are switched on when plugged in and as many of them have a trigger lock which keeps it in the on position. If you do not make sure your machine is in the off position before plugging it in, your machine could end up flying across the room when plugged in. This is not only dangerous to you but also can damage your expensive power tool. Sanders are powerful tools used for sanding that will make your DIY project a lot easier and make those physically tedious tasks a lot more pleasant to perform. Buying the right tool for you is essential and we have reviewed the best available on the market for 2019 for you to consider when making your choice. Consider all the benefits each one offers such as power, variable speed control, and quick-change belt lever to name but a few. We hope that our reviews of the best sanding tool available on Amazon today is helpful and our buyer’s guide offers you some insight into these best machines. The only thing left to do is get your sander and start that project that you have been wanting to tackle. The Makita 9903 Variable Speed Belt Sanding tools are the best tool for DIY enthusiasts and professional general contractors alike. It has a powerful 8.8 AMP motor that maintains a consistent speed even under load and it offers electric speed control. The auto-tracking belt system allows you to track the belt without needing to adjust it and the innovative design lets you sand flush to the wall suing the nose and side of the sanding tool. Best of all the Makita has a low 85dB noise output. With its large front grip efficient dust collection and 16.4 foot long power cord for the best maneuverability as well as a low profile design allowing for the best balance make this tool one of the best on the market for 2019. The best power for the large projects as well as being comfortable to hold and ease of use make Makita 9903 Variable Speed tools for sanding are our best choice of belt sanding tools for 2019. Don’t let the price of the best sanders put you off. It is best for both the professional and DIY enthusiast offering variable speed control and a hugely powerful 12 AMP motor. The motor is placed over the plate which gives these sanders best balance. It is ultra-durable with a heavy-duty all metal design. Adjust your belt easily with the belt-tracking knob and select your speed settings using the variable speed dial. Changing your belt has never been quicker or easier using the quick release belt change lever and the fingertip belt-tracking knob will reduce excessive down time and allows you to dial in belt alignment over the rollers. The large 360 degree swivel dust collecting bag will effectively and efficiently ensure that the majority of sawdust gets contained keeping your workspace clean. For all its best features and superb power the Porter-Cable 362 sanding tools are our premium choice for 2019 and you will not regret spending the extra money to acquire this best rated power tool. Versatile, fast and extremely efficient the Genesis GBS321A is our pick for the best value for 2019. The powerful 8.0 AMP motor operates with consistent speed even under load. Match your speed to application with the variable speed control dial. The low profile design offers superb balance and with a flat-side you can get into those tight spots that are difficult to access. The auto-tracking belt system tracks the belt without adjustment and it offers minimal downtime, which is especially important to general contractors with it quick-change belt change. The dust collection bag is large enough and efficient enough to keep your work areas clean and clear. The 6.5 foot power cord is long enough to allow the best maneuverability which is best for larger projects. With a front grip handle that is adjustable to offer the best comfort and ease of operation as well as being a lot less noisy than other belt sanders the Genesis GBS321A Belt Sanders are the best cheap option for any DIY enthusiast or professional contractor. We hope you enjoyed our article on "The 10 Best Belt Sanders", if so, please share and rate it. I was in the market for a good belt sander but I wanted one that wasn’t too loud but at the same time I needed it to be powerful as I use belt sanders on a daily basis so Looking at your review on belt sanders and found the Makita 9903 was best suited to me and my needs so thank you for the help.